Affordable, impressive design and durable. Cover could be stirdier. No heater. Made of acrylic, not glass. I’m a huge fan of the Tetra company. Not only do they make fantastic products, ranging from fish food to aquariums and accessories, their products just last longer than others. At least in my opinion. Most likely because the company has been around for over 50 years and has been extremely dedicated to the constant improvement of their products over time. The 5 gallon Tetra Crescent Acrylic Fish Tank is no exception. But does it make a great betta fish tank? Keep reading to find out! First, What Does It Come With? The overall set-up on the aquarium is very easy. First, choose the location, which should be a flat, level surface close to an outlet. (Try to avoid an extension cord when possible). Also, don’t place in direct sunlight. Rinse all the accessories (rocks, plants, decor, etc.) and equipment (filter cartridges, etc.) that you plan on using. Add about five to ten pounds of rinsed gravel. (Note: The company suggests sloping the gravel bed front the back of the tank to the front, to give it the appearance of more depth. Treat your water ahead of time with a water conditioner (e.g. : Tetra Aquasafe) in order to remove some of the chlorine and possibly other harmful chemicals. Once done, fill up the aquarium, but leave 2-3 inches at the top for now. Add your plants and decor. Tetra recommends adding bacteria to the tank (e.g. : Tetra SafeStart) when adding fish. Install the hanging filter and the plug it in. 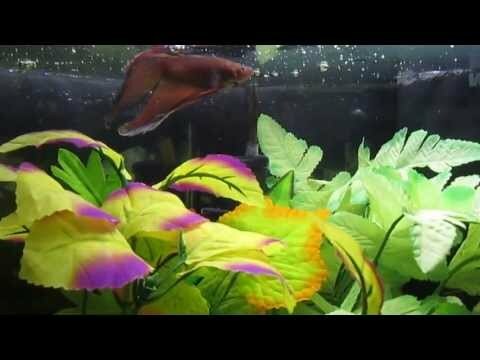 Highly recommended – Install a heater for your betta fish (*** Insert link ***). They will appreciate it. For more details, have a look at the Tetra Crescent Owner’s Manual. Mechanical filter – The Crescent Acrylic 5 gallon Tetra Aquarium comes with an excellent mechanical filter that is fantastic in removing all the the nasty particles from the aquarium. With this filter, your fish will enjoy clean water, free from uneaten food, sludge, excrement and dust. The filter does a great job in removing all of it. To prevent build up, you can clean the filter very easily. Another important thing to note about the filter is that you can reposition the filter using a switch on the back of the filter to adjust the flow. In our opinion, this is a must have if you have betta fish because some are more “temperamental” than others and don’t necessarily like a faster flow. LED lighting – This aquarium comes with excellent LED lighting which is very easy to install. Just make sure you don’t twist the screws too tight when installing it, to avoid cracking/damaging the aquarium. Ultra activated carbon – Not all aquariums are great at containing/removing odors, however this aquarium uses ultra activated carbon, which does a great job in the removal of discoloration and odor. It’s size – This Tetra aquarium gives you ample space for your betta fish to swim around in and be comfortable. In our opinion, bigger is always better. With this aquarium, your fish will have more water to enjoy. The added bonus of holding more water (than a 2 or 3 gallon tank) is that it does a better job at diluting chemicals or other substances that may pollute the aquarium, which can cause your fish to be sick. To support its size, the Tetra Crescent Acrylic Fish Tank comes with a sturdy base that keeps it firmly in place. Cover – The cover is a bit flimsy, and has a small opening at the top. A betta would have to make a perfectly timed and precise jump to make it through, but nonetheless, the risk is there. Tetra could improve this tank by making the opening a bit smaller (or replace it with one that you can open and close) or making the cover a bit more sturdy. Material – Acrylic tanks aren’t bad necessarily, however we found that the shell of the tank was a little bit thin and Tetra could have made the shell a little bit thicker. We can’t say that we’ve had any problems because of that, however it’s something we wanted to mention. Talking about the design of this acrylic fish tank, we can simply say it is amazing. If you are looking for the most affordable 5 gallon aquarium, this is one of the best choices by far. Compared to other competitors, the Tetra Crescent Acrylic Aquarium 5 gallon costs around 50$ dollars, while other competitor aquariums offering the same features cost over a 100$. You definitely get more bang for your buck with this one. Before you leave, please check out our SHOP for amazing deals on betta fish tanks, decorations, supplies and more! Interested in other tanks? Check out our other fish tank reviews. Updated on 2018-05-20 – Included additional information on what’s included with the kit and the set-up instructions. I bought this one off of Amazon a while ago and it came with a crack. Had to send it back unfortunately. Didn’t bother getting another one.